If your computer doesn’t already include a solid state drive (SSD), the odds are that it soon will. In less than a decade, SSDs have decreased in price as quickly as their technology has evolved, and in the next two or three years, they are likely to replace mechanical hard drives altogether. As their name suggests, unlike mechanical drives, SDDs have no moving parts. They rely instead on integrated circuits for storage, which makes them many times faster, and almost silent as they operate. In fact, without indicator lights on the case, first time users sometimes worry that they are not running at all. Relying on flash memory, SSDs can only be written to a limited number of times. When commercial SSDs first became available, the number of writes was relatively low. Moreover, Linux did not install in ways that optimized SSD performance. As a result, numerous tweaks have been developed over the years to improve the performance of SSDs and to help them last longer. Today, knowing which tweaks still apply or are still necessary can be hard to figure out without intensive research. To save readers the effort, below is a summary of what, so far as I can tell, helps optimize SSDs on Linux. Although the price of SSDs varies depending on the manufacturer, top-of-the-line models are still as much as 450% higher than traditional drives for a one terabyte drive. Two or three terabytes drives are even higher, and correspondingly rarer. Because of this price difference, some manufacturers offer hybrid drives — a mechanical drive with a solid state drive for a cache. Hybrids are typically 10-20% more expensive than mechanical drives, and usually offer about the same percentage of improvement in performance. They are obviously a transitional technology, unlikely to survive once SSDs become less expensive. Instead of a hybrid drive, those of us unable to afford switching entirely to SSDs — that is, most of us — will get vastly better performance by buying an SSD large enough for their operating system, and a mechanical drive for their /home folder, and any other directory being used for storage. The cost will be only 25-75% more than the same amount of storage using mechanical drives. In the interests of reducing the number of writes to an SSD, format the partitions on it in ext4. Other journalled filesystems, such as XFS, JFS, and Btrfs write far more often to disk. In fact, only a few years ago, some articles suggested either disabling the journals on SSDs, or not using journalled filesystems at all. to the bottom of /etc/sysctl.conf. Usually, the default number is 60, so you can add whatever number works best for you instead of 1. In addition, if you have enough RAM, you can put /tmp and /var into RAM disks, although that positioning may cause you to lose valuable log information if your system crashes or reboots, and might be a security risk. Probably,this arrangement works best on machines that are always running. As for the swap partition, you can replace it with a swap file on a mechanical drive, or even do without it if you have enough RAM. However, some applications have their own caches, and start accessing swap as soon as they start. To minimize writes, you might also place the swap in RAM, even though that otherwise seems pointless. fstrim — or trim, as it is frequently called — is a command included in the util-Linux package. It is used to discard blocks that are not in use on an SSD, and can be safely wiped. Unless fstrim is run regularly, the drive spends more and more time looking for blocks to which it can write, so, in a sense, fstrim has an effect roughly analogous to defragmenting the drive. Running fstrim is necessary because, until recently, most distributions installed without being optimized for SSDs. Releases of Ubuntu and Linux Mint made in the last two years install and set up fstrim to run once a week, but other distributions, including Debian and Fedora, do not. The first column sets the script to run once every seven days, the second to run ten minutes after the machine boots. The -v option gives you full information about the results of running the command, while the echo command adds the date and time that fstrim was run to the log. Many articles suggest running fstrim once daily, and at least one suggests running it several times a day. Remember, though, that part of maintaining an SSD is to reduce the number of writes, and running fstrim more often than necessary increases the number of writes. The man page states that you only need to run fstrim once a week, so regularly running it more often might substantially decrease the lifespan of an SSD. For a while, SSD partions were trimmed by adding the discard option to a partition’s entry in /etc/fstab. However, including discard is far more active than running fstrim, since it trims on the fly. This behavior means that discard writes to the disk far more often than fstrim, which makes it counter-productive. Although discard still has its advocates, I am unaware of any distribution that advocates using discard rather than fstrim, although you can easily set it up if you choose to you it. A boot option that actually does reduce the number of writes is noatime. Atime is the last time that a file or directory was opened, one of the basic pieces of information recorded in Linux. However, usually, atime is far less useful than when the file or directory was last changed, another basic attribute. Most of the time, you can disable atime without any adverse effects, thereby reducing a significant number of writes. To enable noatime, open /etc/fstab, and add it to the fourth column for each partition listed. The fourth column is a comma-separated list of how to mount the partition at boot, usually starting with defaults (see example of placing /var and /tmp into a RAM disk, above). If relatime is included in the fourth column, delete it before saving the file. How Many Writes Before an SDD Fails? Start researching on the Internet, and you can find other suggestions of how to reduce writes, including changing the scheduler, avoiding using hibernation, making sure that Windows cannot accidentally defrag your Linux partitions on an SSD, and adjusting the caching of Firefox. However, most of these suggestions are not widely mentioned, so I hesitate to endorse them. Keep in mind, too, that SSDs are a new technology that have not been in use long enough for anyone to have a precise idea of how to optimize or preserve them. Moreover, modern SSDs support significantly more writes than those of only five years ago, and more expensive SSDs may support more writes than cheaper ones. For example, the Samsung Evo 850 line, generally rated among the better models of SSDs, comes with five or ten year warranties. Since warranties are apt to be conservative, these SSDs could have the potential to last even longer than ten years — two or three times longer than many mechanical hard drives. In fact, the Evo 850 product line is estimated to be good for 600-1000 terabytes of writes. Since one user estimated having only 12.5 terabytes of writes in three years, the concern about writes may be obsolete, at least with such high-end products. Still, no one knows how accurate the estimates of a ten year life span may be, for the simple reason that few — if any — SSDs have been in use for ten years. Regular trimming and reduced writes will certainly improve the performance of SSDs, and, in another five or ten years, we might find that these precautions extend their life-spans as well. 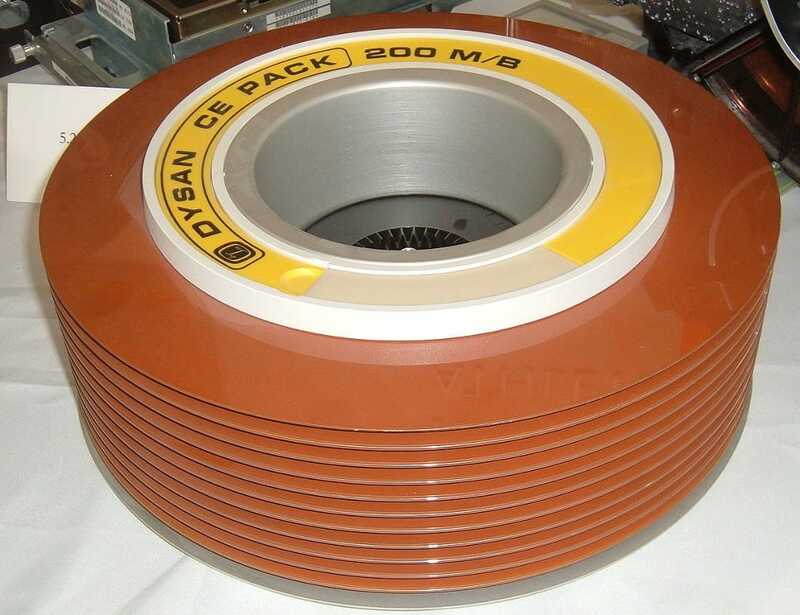 Cover Image: Dysan removable CE disk pack from 1970s (est) could hold 200 megabytes of data, had a diameter of 365 mms and weighed over 4 kilos. This photo was taken by Arnold Reinhold and is distributed under a Creative Commons Attribution-Share Alike 2.5 Generic license. Swap partition in RAM? Logs in RAM? No thanks. I wouldn’t recommend these tips. tmpfs is great for /tmp and /var/run but I would’t use it for /var/tmp and /var/log. Neither of those should be wiped automatically at reboot. fstrim -va is an invalid command. The proper format is fstrim [options] with spaces between the v [verbose] and mount point. Who knows what the a mount point is in your example. It just shows you have no real clue what you are talking about. Look up the man page. -a or –all runs fstrim on all partitions on an SSD drive, reporting each of them separately. It doesn´t need a mount point in the command. If I were you, I´d be cautious about accusing people of not knowing what they are talking about. Interestingly on my fully updated Centos 7 box fstrim -va does work on all partitions, but the manual page doesn’t mention the -a option. That’s with fstrim from util-linux 2.23.2. However, putting swap on a ramdisk? That shows a complete lack of understanding of what swap is. Some applications run their own cache from the moment they start. That means that, depending on your machine and the settings, you could be going into swap immediately. Since the whole idea is to avoid writes to the disk, that´s a situation you probably want to avoid. We accept criticism gladly on this site and we also take it to heart, revisiting and often re-writing our texts so they reflect what we learn from our readers. We consider this site a two-way street in which readers can influence the content, helping us spread helpful and accurate information. However, if you want to disparage what we write about *in that tone*, I recommend you take it to you own outlets. If you comment on this blog, you should do so polite and thoughtfully, or you will be banned. Consider this your first and only warning.